"Back at home we sometimes run for 5 or 6 days, day and night. Twenty-six miles not far. And we will do the whole marathon with no water. We often travel for many days, eating only twice a day, and we have no water." -Masai warrior, Isaya, who will run the Flora London Marathon with some of his fellow tribesman in traditional Masai gear to raise money to find a water source for their tribe. Clearly the Brits need to go to diversity training in Eugene as they have told the Masai not to urinate in public or kill any livestock they see. Colleen De Reuck Out of Olympic Marathon Trials Not sure if she had a good chance to make the team anyway, but the women's field is incredibly weak. 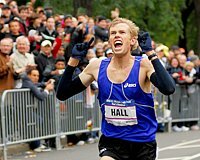 We'll really start our blowout coverage on Wednesday with Ryan Hall's press conference. (Ryan is going to get a lot of attention this week as he has 2 press conferences). But the London betting odds are already out. Profile Of Britain's 2nd Marathon Medal Hope - Mara Yamauchi The 34-year old diplomat has developed into a serious medal threat. Given the fact she was raised in Kenya and now lives in Japan, it only seems logical that she's a good runner. Olympic Torch Has to Be Extinguished 5 Times Due to Protests in Paris Up next the torch comes to the US. Hillary Clinton has called for a boycott of the opening ceremonies but we have a better idea. 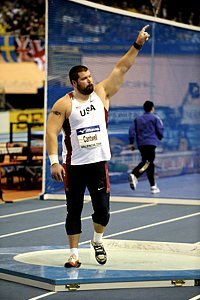 The athletes should instead of waving do the sign language symbol for SPEECH which a letsrun.com fan tells us is a wave with the back of the hand facing out. *Polo to Outfit US Team at 2008 Olympics in Opening Ceremonies If the ceremonies are boycotted no one will be able to see all the clothes made in China. Alan Webb DNF's at Carlsbad 5k As Ethiopia's Terefe Zewdie Edges Mo Farah A 16th place finish in the US 8k a few weeks ago was attributed to food poisoning, but Alan Webb is now at a total-loss to explain his shocking DNF from Sunday. Making things even worse for Webb is the fact that the opening pace was slow (4:25 opening mile) and Webb was struggling to keep up. Cherry Blossom 10 Miler In DC: Ridouane Harroufi and Lineth Chepkurui Win Harroufi took the first 5 miles out in 23:05 and then outkicked Nicholas Kamaky by 1 second to win in 46:14. Chekurui, who was 14th at world xc last week, won in 54:21 as Catherine Nderba was 4th in 54:52 . *Prerace Profile: Ndereba Focused on Winning Gold in Beijing Interesting to see that her agent says she hasn't been invited to Boston for 3 years. Great Ireland 10k: Doris Changeywo Pulls Away From Jo Pavey - B. Johnson was 7th- Abraham Chebi Wins Men's Race in 28:48 Pavey left the race pleased with her fitness as Changeywo, who was 4th at world xc last week, only pulled away from her on the last hill and Pavey isn't a good hill runner. The good news for Pavey - there will be no hills in the Beijing 10k in August. Masai Told to Not Kill Livestock They See, Not Urinate in Public Maybe the Brits need to go to Eugene for diversity training.